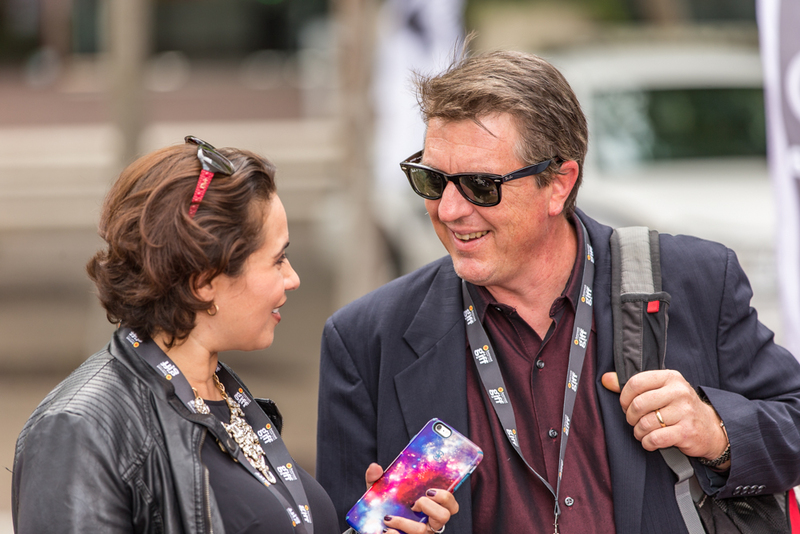 This year’s Gasparilla International Film Festival (GIFF) has been a whirlwind of fun and entertainment so far, and there’s still tons of movies and events to enjoy this week, including this year's infamous GIFF closing night party at the Vault in downtown Tampa. This past Saturday afternoon, family audiences enjoyed two presentations of Kid Flix, a collection of award-winning short films from the New York International Children’s Film Festival. Featuring both animated and live-action entries from the US as well as the Czech Republic, Australia, the UK, and other countries, these feisty shorts entertained both kids and parents with a variety of imaginative storylines. The Saturday afternoon program also featured Breakable You, starring Academy Award-winner Holly Hunter and Seinfeld’s soup nazi, Tony Shalhoub, sporting a very Walter White-esque bald ‘do. Directed by Andrew Wagner, the movie is adapted from a novel of the same name by Brian Morton. Hunter and Shalhoub portray the Wellers - divorced, artsy New Yorkers, with a kvetchy daughter who’s a grad student in philosophy. It’s very reminiscent of middle era Woody Allen, but with sexier jokes and not quite as much cynicism. Sunday was Family Fun Day at Ybor City’s beautiful Centennial Park. Several cute animals (water dragons!) from Tampa’s Lowry Park Zoo were there, and the little ones really enjoyed the free screening of Disney’s Zooptopia. Later in the afternoon, the Festival’s high school competition on Sunday gave young filmmakers a thrilling chance to show off their work. And Sunday evening, the Big Brothers and Big Sisters of Tampa Bay were treated to mountains of fresh buttered popcorn and a special showing of DreamWork’s Trolls. On Sunday night, festival goers got a rare chance to see Handsome Devil, a sweet LGBT coming of age tale from Irish writer-director, John Butler. Starring Fionn O’Shea and Nicholas Galitzine as roommates at a traditional boarding school that’s as obsessed with rugby as Texas high schools are with football, the comfortingly predictable story arc is full of tenderness and charm fueled by an excellent alternative soundtrack. Ladies from across Tampa Bay lined up for Monday’s showing of Lost City of Z, starring former sparkly vampire and hottie Robert Pattinson. Directed by James Gray, this film is based on the true story of British explorer Percy Fawcett, his obsession with a lost Amazonian civilization, and his mysterious disappearance in 1925. Fawcett is played by Charlie Hunnam, a studly blonde actor from Newcastle who portrays a military man turned explorer with panache - but rumor has it that initially, this role belonged to Brad Pitt. Pattinson is loyal sidekick Corporal Henry Costin, offering plenty of stiff upper lip and manly encouragement in the face of adversity. There’s PLENTY more coming up at the 2017 Gasparilla International Film Festival. 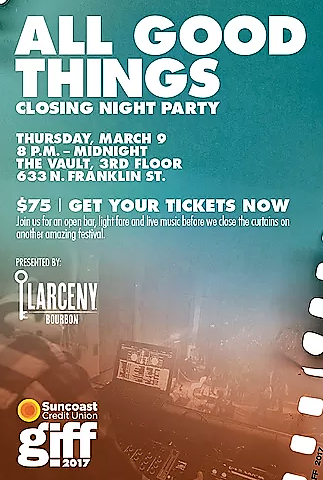 Follow the link to their website to learn more about the comedies, dramas, parties, panels, and this year's novel closing night event at The Vault. Word is the party is nearly sold out and only 20 tickets remain! Call 813-693-2367 today to reserve your spot on closing night as GIFF awards festival winners, screens the closing night film, and parties into the wee hours GIFF style. Trust me, you do not want to miss this! Follow GIFF events, parties and more through our photo albums, 813area photos are always FREE to download and share, let us know if you would like our 'pro paparazzi' to cover your event!